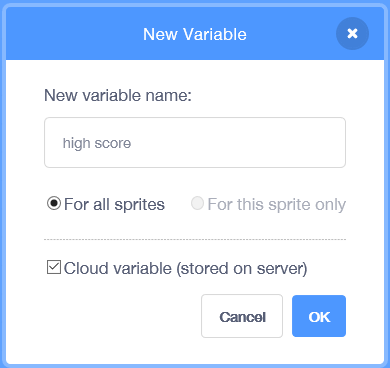 The process to create a cloud variable in Scratch 3.0 is much the same as creating a regular variable; the only difference is checking the "cloud variable" box. The note that appears after creating the first cloud variable in a project. Cloud data is a feature that allows users to store variables "in the cloud," or on the server. Cloud variables have the character "☁" (a cloud icon in the font Scratch uses) in front of them, to distinguish from regular variables: It may use a different font if one's computer does not support it. Cloud data logs can be removed by the person who created the project. For example, if there is a test and someone does not want their score shown, but it goes onto the log, the creator can remove the log. There is a limit of ten cloud variables per project. They update automatically, as opposed to requiring refreshing before updating. While the update is not instant, it is usually relatively quick. Cloud data may not be used by New Scratchers. The Scratch Team does not want people new to Scratch misusing cloud variables, as it could put a large load on the system that it cannot handle (see section "Issues with Cloud"). Cloud variables use the regular blocks associated with variables. The only difference is that the value is truly global, and is reflected across all copies of the project being viewed on the Scratch Website. Cloud data is referred to as "persistent" in the code and some early development versions. Since Cloud Data is stored on the server, cloud variables cannot be used in the Offline Editor. Cloud variables are maintained through a secure Websockets connection. To avoid overloading the cloud data infrastructure, cloud data updates are limited to a certain number per second when a project is being run. One should always avoid attempting to update a cloud variable in a fast loop that does not wait between updates. Generally, one should carefully consider how often a cloud variable is updated and try to limit any updates to only times when it is needed, such as when the value actually changes, and to limit how often the variable is updated. If variable is being updated too often, the cloud data server will drop the connection temporarily and updates will not be sent to the cloud data servers until the connection is automatically re-opened after a variable waiting period. Cloud data has a limit of up to ten (10) cloud variables per project. It was accidentally limited to eight immediately after the relase of 3.0. Cloud variables can contain only numbers (unlike regular variables, they cannot contain letters). A character limit of 256 digits per variable has also been implemented (formerly 128 digits). Hexadecimal numbers are no longer supported. Cloud list engines are projects or scripts that store lists in cloud variables. To do this, they encode lists as a number, and set a cloud variable to said number. Later, the same code can turn the cloud variable back into a list. This was developed based on the idea that anything in the world can be represented with numbers. For example, all letters in the alphabet could be stored as number by assigning each letter a number from 1 to 26. A couple of examples of cloud list engines are here and here. You can use base 11 for only numbers and convert it to base 10. than to decode it, first you have to convert to base 11. When the Scratch Team released the beta version of cloud data, they set up public logs for projects with cloud data in them showing the time cloud data was modified, who modified the data, the current value of the data, and the type of action of the data modification (such as del_var, rename_var, and set_var). To get onto the log simply click on the cloud data button at the bottom of a project page. This will then show you the users who changed the cloud data and at what time. If the user changes cloud data blocks not in their own project the cloud data will not be saved. Upon the release of Scratch 3.0, the Scratch Team mistakenly set the limit to eight cloud variables per project instead of ten. On January 9, this was fixed. when key [space v] pressed::hat events //This script will "broadcast"
with a When I Receive block for each possible broadcast. Due to cloud data limitations, a project using this method of broadcasting can only use broadcasts with numbers for messages. //to get the result from this. //The base-10 output is stored in the variable "result"
In October of 2016, the cloud infrastructure started to fail occasionally. As a result, many multiplayer focused projects did not work correctly. This has been attributed to the ever increasing number of active users who are using cloud variables, with some projects sending up to 30 requests per cloud variable per second. This effectively "spammed" the cloud server with a load that couldn't be handled by the current infrastructure and shut it down. As a temporary fix, cloud variables have switched to using a different polling method, which is more reliable but significantly slower. Furthermore, the polling interval time was increased, to prevent spam. This new method works, but may cause cloud variables to "rubber band" and reset to a previous value after it has been changed, as well as making many multiplayer projects less "real-time" or completely breaking them in general. As of August 2017, a new cloud data system was in beta. It used secure websockets as the communication channel. To use the new system, one could add ?newcloud to the end of the URL address to a project. The system is now the default. ↑ https://scratch.mit.edu/discuss/topic/331439/ "The maximum number of cloud variables allowed in a project was mistakenly limited to eight rather than ten. This limit is now 10 variables again!" This page was last modified on 9 February 2019, at 00:09.